This dialog box is a work of art, truly. ;) It filled the screen on a 1024x768 laptop. I've read through it, completely, four times, and I'm still not quite clear on what it's trying to tell me. One day I shall unlock its hidden secrets. First, it took me a moment to realize that the choices were meant to be clicked on. They are neither buttons nor hyperlinks. The first choice just closes the dialog...doing nothing. Apparently I'm supposed to make sure my microwave is turned off. The second one tries to be generic by saying "The following policy" in the first hard-coded sentence. 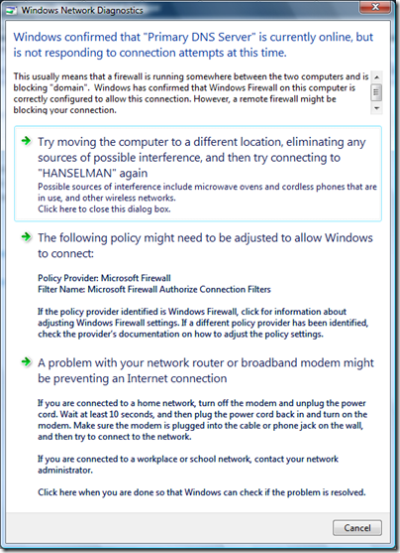 Then the last paragraph actually references BACK to the list, forcing me (rather than the computer that actually has the information) to figure out if the "policy provider identified is Windows Firewall." If it wasn't, I'm to "check the documentation." Helpful. Really. Danke. I ended up right-clicking on the connection in the tray and selecting Diagnose and Repair and all was well. I also reveled in the fact that Diagnose and Repair was NOT available when using the much more common single-left-click on the network connection icon. Oy, the networking in Vista is SO confusing. All I can count on is netsh (how-to). ...can make you look like a superstar whilst others are still clicking around. Vista Vista. I'm totally happy I've seen it just on youtube, and not a bit closer ;). Although they say "know your enemies"... There _are_ exceptions, right? On why modems are called modems -- you're certainly right that the name means actually "modulator/demodulator". But, as a matter of tech slang, these terms are not necessarily meant to express digital/analog conversion; digital signal can be modulated into another format of digital signal, which is what happens when you plug your modem into, say, cable TV outlet. The signal is still digital; it's just another kind of digital. BTW pity my English -- it's pretty much stillborn :/. 'Modem' is an accurate description of the bit of any ADSL router that plugs into the phone line. The way these things transmit and receive digital signals over an analogue medium really isn't so different from your old v.32bis modem. What exactly are they modulating? The usual stuff - amplitude and phase, typically. Most ADSL systems use 'DMT' - Discrete MultiTone - which involves using a very large number of carrier frequencies. (I'm not sure how many ADSL typically uses, but broadcast digital video typically uses a similar scheme, and there it was common to have about a thousand carrier frequencies.) On each invididual carrier, phase and amplitude modulation is performed, in much the same way as good old-fashioned modems designed to work over the audio channel of a telephone connection. So 'modem' is an exactly appropriate name. On Windows XP, netsh will not work unless you are an administrator. No information, no error message. Using ipconfig /all works just fine. When I tried again with Runas administrator, netsh gave me the information I expected. I'm assuming you are running as an admin without UAC on Vista. I wonder how many clicks you would truly save if you still had UAC on. The networking on Vista is confusing and frustrating. After 6 months of fighting it on my tablet, I'm planning to re-image back to XP this weekend. 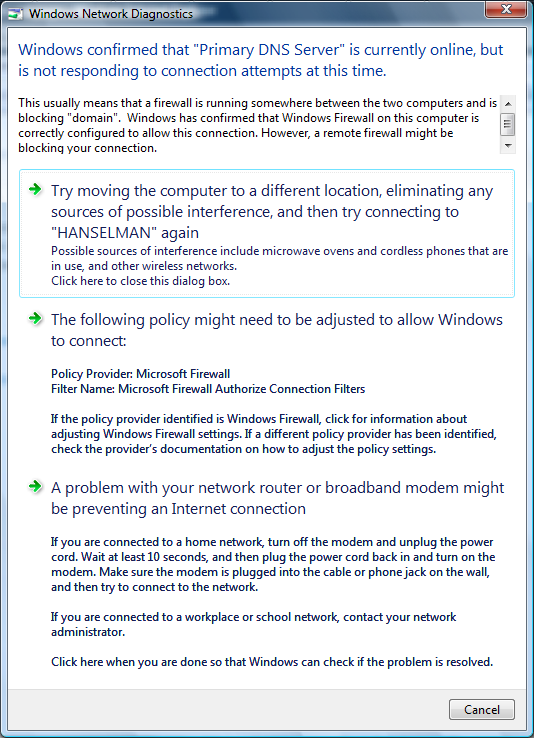 I just got my new Vista laptop a couple days ago, and getting it on my wireless network was painful. I've added about a dozen different laptops to my network before and none of them have given me so much trouble. I've only had this laptop for 2 days, and I'm already contemplating paving it and installing XP. On the plus side, Aero Glass is nice... and slow. As a follow-on to Ian Griffith's description, cable modems are pretty much the same way. In the cable case, they are referred to as "RF modems" since they work in what's basically a contained radio domain. It's not terribly different from something like XM or similar digital broadcast radio, but in two-way form. Does the click here action in the third box actually check the issue and if it does why doesn't the first box do the same thing? If I turn off the microwave, I want Windows to close the dialog box and do the check. ISPs which give you the "modem" call it a modem. Doesn't Raymond Chen work at Microsoft anymore? On Vista with UAC enabled, "netsh interface ip show config" runs without any additional prompting. I believe I am running as an Administrator, but assuming you aren't and you need to elevate to run this, just press the Windows/Start key (CTRL-ESC), cmd, CTRL-SHIFT-ENTER, and select Continue (ALT-C) at the UAC prompt. Now type all the elevated commands you want. It seems that all the multi-select Vista dialogs are just horribly designed. The one that gets me the most is the File Exists dialog when you copy files, with its 4 or 5 options and the defaults set completely opposite to intuitive behavior. It takes 3 clicks to accept this damn dialog in the most common scenario (which is to overwrite).